These Oak radiator collars are thin and are unobtrusive and are sanded to a fine finish they are quick and easy to fit ,there is no need to remove the radiators to fit them.It is easier to finish the wooden radiator collars to the required finish prior to cracking and fitting.You can purchase wooden radiator collars to fit 15mm,10mm and 22mm pipe below. To fit these wooden radiator collars is easy to do ,the method to fit them is to snap the radiator collars over a steel nail or similar object.This results in the break being irregular line ,place the two halves around the pipe and glue with superglue (do not use activator as it dries white).As the joint is irregular it is almost impossible to see the joint. 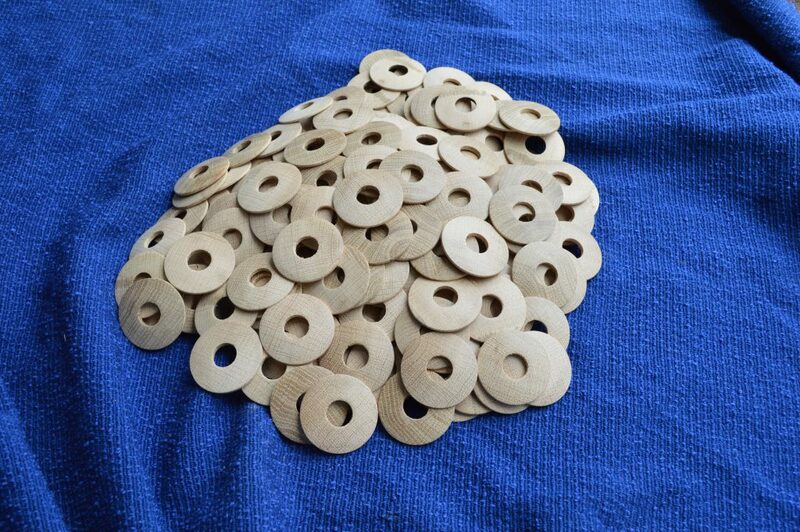 A large order of hand turned Oak radiator collars by Phil Jones professional wood turner. Please note these are a made to order product and are hand turned so slight variations is to be expected.